I promise my next post will be a recap of our evidence from the Palmer House, but sifting through audio and visual evidence takes LOTS of time, and I don’t know if I’ve mentioned that I have THREE kids and can only work on my writing stuff AFTER all the monkeys have gone to bed. So writing time is limited, and the past month, I’ve been wrapping up a pretty major project…which NEEDED to be done by this weekend. For the last year-and-a-half, I’ve been writing a screenplay with a friend of mine (I won’t tell you who, because we’re keeping that a secret until after we sell it – so if you’re curious, pray we sell it fast). This Sunday, a brave group of my friends will be gathering for a table-read so my co-writer and I can listen to our script aloud. I’m just hoping it sounds as funny outside my head as it sounded inside it. Last night, I had to print off copies of our screenplay because I need to deliver them to our readers before Sunday so they can have an opportunity to get into character – you know, they may be method actors so they might want to spend the remainder of the week living as whomever I assigned them to read. I’m not gonna lie. Holding that first printed copy of our screenplay was a little emotional. When the nice boy behind the counter handed it to me and asked if it looked alright, I told him it was “so cute” – then I hugged it – then I cried a little. Then I sat in a coffee shop next door and waited for him to print the remaining 12 copies – looking at that stack of paper beside my laptop – drinking “Calm” tea – swiping at tears of joy. I had a similar experience when I held the printed copy of my manuscript. There’s just something about seeing that stack of paper that makes it feel so real. When I finally got home with my box of scripts, my husband snapped a quick picture. So, of course, I had to share it with you all! 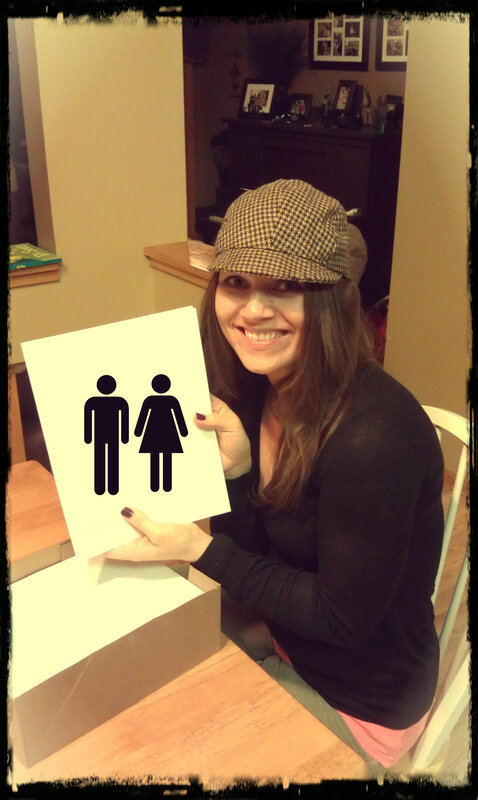 I had to cover up the title and by-line, so I used the restroom-sign people. I can’t explain why, but trust me, this is totally fitting for this project – actually, it’s brilliant, if I do say so myself. Hopefully, soon I can tell you more about this project. But for now, I’m just gonna have to be a bit of a tease (again). Now, back to work on my paranormal evidence. I’m downloading some pretty sweet EVPs to share with you all. Sorry, there I go teasing you again. We Came. We Saw. We Captured Some EVPs!